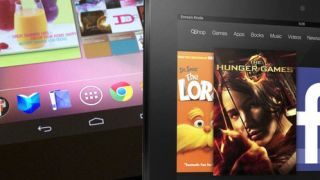 It may be turning heads, but the Amazon Kindle Fire HD falls short of the Google Nexus 7 killer that some people would like it to be. As our Amazon Kindle Fire HD vs Google Nexus 7 shows, there are certainly some significant areas in which the former moves past its 7-inch rival. However, there are other key areas which it absolutely does not exceed expectations and they remain potentially important to a big swathe of tablet buyers. The first problem for me is the dual-core processor in the Kindle Fire HD 7; the Google Nexus 7's Tegra 3 is a quad-core affair and it helps make the tablet an absolute dream to use. The Nexus 7 remains one of the most responsive devices on the market, flitting between apps and games effortlessly, multitasking with aplomb. Although having a dual-core processor has been justified by some companies as more efficient in a mobile device (something which is a hot-ticket conversation in mobile phones at the moment), I think many people would trade a couple of hours life for a big boost in top end performance. The Kindle Fire HD does, of course, give you a big chunk more storage for your buck, doubling up at both price points - and that's definitely a big bonus, with 8GB feeling paltry given the size of HD content. But for many, it's not the reason to buy Amazon that it will be billed as. Weight-wise, the Nexus 7 is pretty much perfect for one handed use; any heavier and it would feel uncomfortable. So it remains to be seen what the (admittedly small) bump in heaviness does in terms of comfort – it's something that needs time to be, ahem, weighed up. But then we move on to the operating systems and I can't help but feel it is there that the Nexus 7– for me at least – lands the crucial blow. It's why the tablet costs as little as it does: Amazon swallows a portion of the cost in the knowledge that you later deposit pots of cash in its virtual registers by buying films, music, books, apps and physical goods from it. So you would expect to be shoved in the direction of its shop regularly and firmly - but its competitor, although not shy about pushing you to its own Google Play store, is less in your face about it. The Google tablet is running the beautifully designed vanilla Jelly Bean 4.1, has more apps, more freedom and, you would assume, is going to receive future updates to Android sooner than Amazon's tab. Of course, you don't get the Kindle books or breadth of material that you get with Amazon, but you can run the Kindle app and Google Books should you desire. In truth, the thing that would massively improve both tablets is a mobile data version, bringing the joys of 3G or 4G on the go. And if the rumours are right, the Nexus 7 3G is on the way; and that could tip the scales even further towards Google in the 7-inch market.